Head restraints/headrests supplement the other vehicle safety systems. They may provide additional protection against injury in certain rear end collisions. 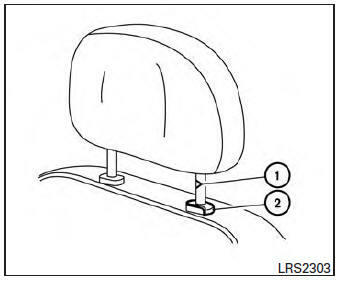 Adjustable head restraints/headrests must be adjusted properly, as specified in this section. Check the adjustment after someone else uses the seat. Do not attach anything to the head restraint/headrest stalks or remove the head restraint/headrest. Do not use the seat if the head restraint/headrest has been removed. 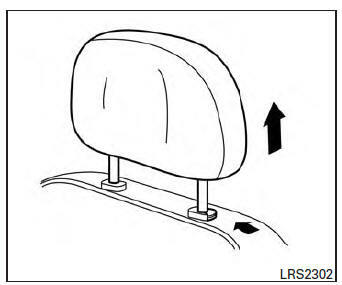 If the head restraint/headrest was removed, reinstall and properly adjust the head restraint/headrest before an occupant uses the seating position. Failure to follow these instructions can reduce the effectiveness of the head restraints/headrests. This may increase the risk of serious injury or death in a collision. The illustration shows the seating positions equipped with head restraints/headrests. 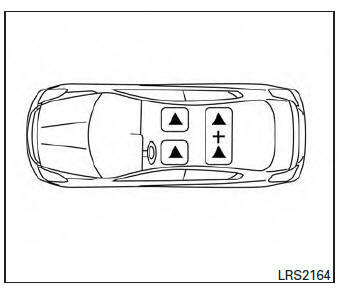 + Indicates the seating position is not equipped with a head restraint or headrest (if applicable). Your vehicle is equipped with a head restraint/headrest that may be integrated, adjustable or non-adjustable. Adjustable head restraints/headrests have multiple notches along the stalks to lock them in a desired adjustment position. The non-adjustable head restraints/ headrests have a single locking notch to secure them to the seat frame. For the adjustable type, align the head restraint/headrest so the center of your ear is approximately level with the center of the head restraint/headrest. If your ear position is still higher than the recommended alignment, place the head restraint/headrest at the highest position. 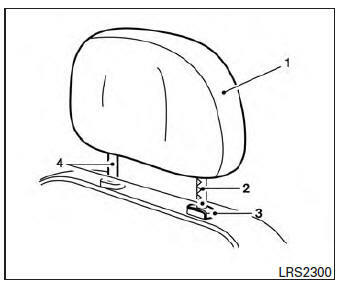 If the head restraint/headrest has been removed, ensure that it is reinstalled and locked in place before riding in that designated seating position. 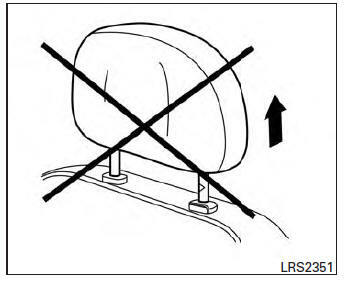 Use the following procedure to remove the head restraint/headrest. 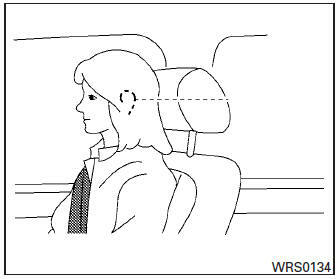 Pull the head restraint/headrest up to the highest position. Push and hold the lock knob. Remove the head restraint/headrest from the seat. 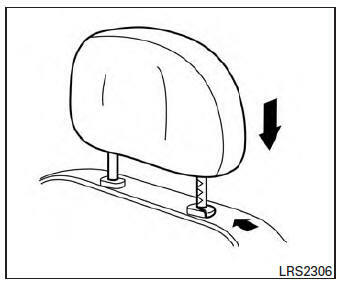 Store the head restraint/headrest properly in a secure place so it is not loose in the vehicle. 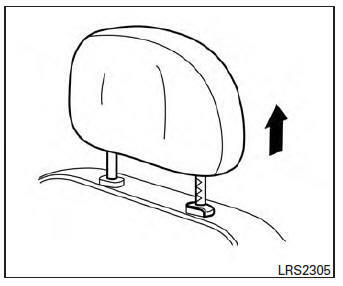 Reinstall and properly adjust the head restraint/headrest before an occupant uses the seating position. Align the head restraint/headrest stalks with the holes in the seat. Make sure the head restraint/headrest is facing the correct direction. The stalk with the notch (notches) 1 must be installed in the hole with the lock knob 2. Push and hold the lock knob and push the head restraint/headrest down. Properly adjust the head restraint/headrest before an occupant uses the seating position.